The Department of Labor’s Office of Inspector General (OIG) recently issued its report on an audit it conducted regarding OSHA’s guidance issuing processes. The OIG said three events in 2015 led to the audit: 1) the Government Accountability Office (GAO) reported stakeholder concerns that federal agencies inappropriately used guidance in place of rules; 2) industry stakeholders alleged OSHA created new rules without going through the rulemaking process; and 3) congressional members expressed concerns over procedures OSHA used when issuing certain guidance documents. The audit set out to answer whether OSHA established adequate procedures for issuing guidance documents and, to the extent procedures were established, whether OSHA consistently followed the procedures. Between October 2013 and March 2016, OSHA issued nearly 300 guidance documents on various topics. The OIG reviewed OSHA’s internal controls, a random sample of 57 guidance documents, and stakeholder challenges to four guidance documents and relevant court decisions issued through April 25, 2017. Auditors determined that while OSHA developed procedures to provide reasonable assurance that guidance accurately reflected its rules and policies, it lacked a procedure to determine the appropriateness of issuing a document as guidance, rather than as a rule. The report found that OSHA did not follow procedures for 80 percent of sampled guidance. Such procedures included: 1) determining if guidance was consistent with OSHA rules; 2) considering the anticipated reception of the guidance by significant stakeholders; and 3) obtaining official approval to issue the guidance. Train officials and staff as needed on their roles and responsibilities for internal controls related to the issuance of guidance and the potential risks of disregarding or circumventing controls. OSHA agreed that significant lapses occurred in the guidance issuing process, and says it is working to rectify existing procedures. 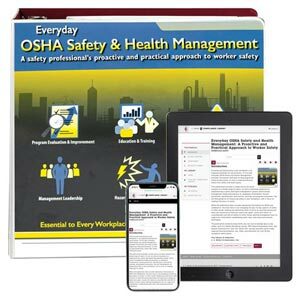 J. J. Keller's Everyday OSHA Safety & Health Management Manual provides "how-to" guidance and tools on a wide range of workplace health and safety issues.